Comedian, writer and avid mental health campaigner Ruby Wax brings her one-woman show Ruby Wax: Sane New World to the Arts Theatre London, following an extensive UK tour. Based on her Sunday Times bestseller Sane New World: Taming the Mind, Wax’s new show helps us to understand why we sabotage our own sanity and how to survive in the 21st century. With a Masters degree in Mindfulness-based Cognitive Therapy from the University of Oxford, the audience is given an accurate and realistic insight into how the mind works. Throughout her career, Wax has worked to increase her understanding of the science behind the brain. In 2015, it was announced that Wax would be given an OBE for her services to mental health. Her first production, Losing It, was based on her experiences of clinical depression, creating awareness of mental health issues. 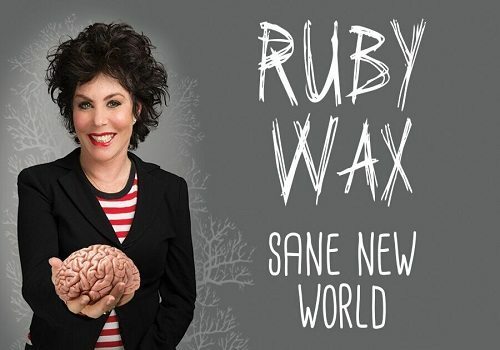 Ruby Wax: Sane New World seeks to develop these issues and show audience members how to tame the brain by inviting them to share their own experiences and build a network of support during the performance. Ruby Wax comes to the Arts Theatre with her brand new show, playing from January 19th to February 13th.